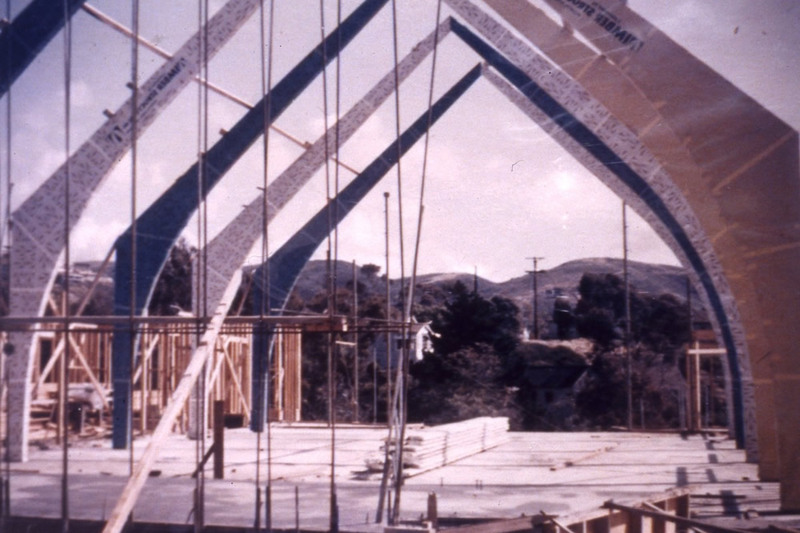 The current Congregational Church sanctuary under construction in the 1960s. In celebration of its 75th anniversary, Neighborhood Congregational Church is partnering with Laguna Friends of Architecture to highlight the extensive and impressive history of architecture and art featured on the church property since 1943. The 6:30 p.m. event Friday, March 9, will begin with refreshments and a docent tour of the buildings and grounds. The tour will include viewing the original sanctuary (now known as Bridge Hall) featuring mahogany beams and stained glass windows and designed by famous architect, Aubrey St. Clair. In the 1960s, a newer sanctuary was built, with its ceiling designed to resemble an upside down ark. The extensive art in both areas was created and gifted by local artisans, some whose families still reside in Laguna today. The tour will also include the Manse, where the pastor would have lived on property in the old days, with quite a short commute to work! The tour will be followed by a presentation by the noted architectural historian and writer, Ted Wells.